Kids have always loved listening to their favorite music, and the louder the better – much to their parents’ dismay. In the 1980s, the portable tape recorder with headphones – which came to be known as the “Walkman” – enabled teenagers to listen to their music as loud as they wanted, anywhere they wanted, without disturbing anyone around them. But the more modern rendition of the Walkman – portable MP3 Players and iPods – pose a major threat to our children’s hearing health, and to ours. The problem is a combination of the technology of portable digital devices that creates a non-buffered crystal clear sound, and the type of headphones typically used with them, which do not have a buffer either. In December 2005, Dean Garstecki, an audiologist and professor at Northwestern University reported that more and more young people were being diagnosed with the types of hearing loss typically found in older adults. He attributed this trend to the “earbud” type headphones that usually accompany iPod and MP3 Players. With the earbud headphones, the sound frequencies are not buffered as they are with the more traditional, ear cup-style headsets. Newsweek Magazine recently reported that researchers at the House Ear Institute found that listeners can unfortunately increase the volume of today’s portable digital devices without the “signal distortion that occurs with traditional analog audio.” The older-model headphones that were popular just 15 to 20 years ago – that have ear cups outside of the ears – had that distortion when the volume was turned up, which functioned as a much-needed buffer to protect our hearing. Today’s technology does not provide that buffer – the earpiece is placed in the ear, not outside of it, and the digital devices do not create that distortion, no matter how high the volume. In addition, people often listen to these devices while they are on the go, and have a tendency to crank the volume in an attempt to drown outside noise, further posing a risk to our hearing. Using the earbud style headphones during activities such as exercise, for example, puts the user at a greater risk. During exercise, blood, which can act as a buffer, is diverted from the ears to other parts of the body – so our already vulnerable hearing is in even more jeopardy. 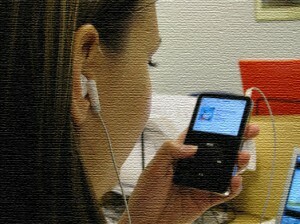 Northwestern University’s Dean Garstecki offers more specific guidelines: His 60 percent/60 minute rule – listen to MP3 Players and iPods for “about an hour a day and at levels below 60 percent of maximum volume.” The problem is, most of the population using headphones – young music fans – listen to their music for much longer than one hour per day. But, you can help minimize hearing loss, damage and problems while listening to your favorite music as long as you want to – the secret is in the headphones. Headphones such as the EX29 Extreme Isolation Noise Reduction Headphones help block out external noise allowing you to hear the fine details of your music without blowing out your ear drums. The ear cup fits over the ear, and not in it, and the headphones are lightweight, don’t require batteries and can be used with your MP3 Player or iPod. With 29 decibels of isolation from outside sound, the quiet headphones block outside noise and there is no need to crank the volume of your music. Aging rock stars like the Who’s Pete Townsend, who has some permanent hearing loss from years of exposure to loud music, and Mick Fleetwood, who has teamed up with Energizer batteries to promote hearing loss prevention, have brought public attention to the fact that many of us take our hearing for granted. But there’s no need to turn off your music – just be smarter about how you listen to it. If you are using your MP3 Player or iPod when you’re exercising, in a noisy environment or you just want to hear the fine details of your music, ditch the earbud headphones and reach for a set of noise reduction ones instead. And you’ll be enjoying your favorite music for a long time to come. This entry was posted in Articles, iPad, iPhone, iPod and tagged hearing damage, iPad, iPhone, iPod, volume. Bookmark the permalink.